Investigator will enter service for the Commonwealth Sci- entifi c and Industrial Research Organization (CSIRO), an agency of the Federal Government of Australia. Investiga- tor went to sea for her initial sea trials in December 2013. Once deployed, Investigator will be among the quietest and most capable research vessels in the world, serving multiple, diverse scientifi c roles in a geographical areas spanning one- third the circumference of the globe. Ltd, Alion Science and Technology of Alexandria, Virginia and Alion Canada of Ottawa. The acoustic analysis, noise treatments and noise trial measurements were performed by Noise Control Engineering of the US. The vessel was launched on July 21st, 2013 and then offi cially named In- vestigator at a ceremony in Singapore in September. 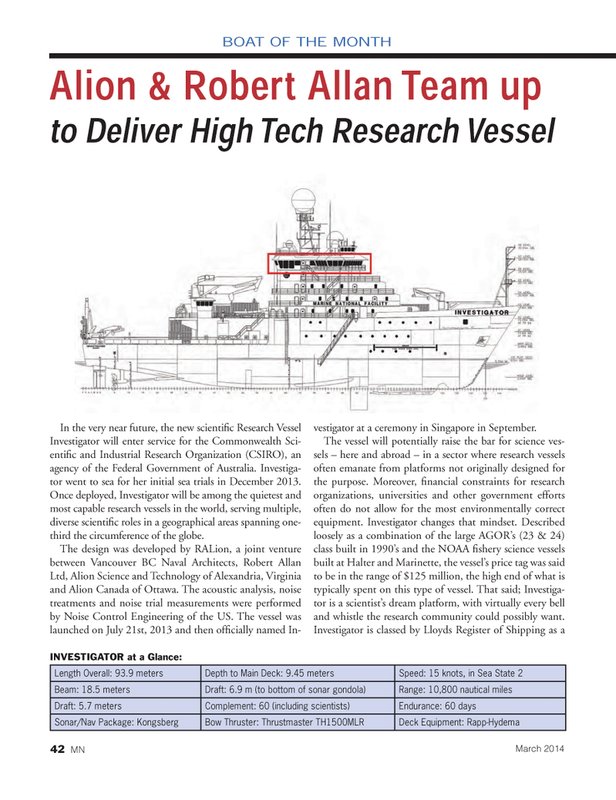 The vessel will potentially raise the bar for science ves- sels – here and abroad – in a sector where research vessels often emanate from platforms not originally designed for the purpose. Moreover, fi nancial constraints for research organizations, universities and other government efforts often do not allow for the most environmentally correct equipment. Investigator changes that mindset. Described loosely as a combination of the large AGOR’s (23 & 24) class built in 1990’s and the NOAA fi shery science vessels built at Halter and Marinette, the vessel’s price tag was said to be in the range of $125 million, the high end of what is typically spent on this type of vessel. That said; Investiga- tor is a scientist’s dream platform, with virtually every bell and whistle the research community could possibly want.